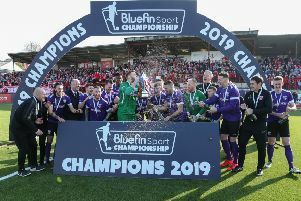 Larne hit the top of the Championship with a professional 2-0 win over Lurgan Celtic on Saturday afternoon. Michael McKenna and James McCabe provided the goals as they eased to victory at Inver Park. Lurgan Celtic started the game brightly with Ritchie Thompson and Josh Barton causing problems for the hosts. A few minutes around the mid-point in the half though, proved the turning point. Lurgan Celtic couldn’t have come any closer to opening the scoring as the move of the match ended with the ball coming off the bar. Celtic strung a series of passes from back to front and Thompson’s dangerous delivery was flicked towards his own net by Chris Rodgers. It was brilliantly saved by Joel Madison and then James Wright could only flick the rebound onto the crossbar. Just three minutes later, Celtic were behind as Michael McKenna fired home at the second attempt to bag his first goal for his hometown club. It was two just seconds before the break as James McCabe bagged his second in as many matches. He dispatched a finish into the bottom corner after a dinked pass from Gary Dorrian. Celtic huffed and puffed during the second period, but a stout Larne defence never looked like letting them through. Thompson saw a header fall over the bar and had a late shot tipped superbly over in the total of their second half changes. At the other end, Larne had the ball in the net for a third time but Paul Maguire was denied by the offside flag. That couldn’t spoil a pleasing day for Larne, as they ended it atop the table. Subs: Arthur, Kane, Templeton, Irvine, Mawhinney. LURGAN CELTIC: McCorry, McVeigh, Rogers, Hutchinson, Fitzpatrick, Lavery, Gibson, Barton, Wright, Thompson, Malone.